Is there adequate soil moisture? Is there adequate remaining growing season? Are temperatures cool enough for seedling development? What potential weeds are likely? What other farm activities are pressing? Cool-season species should be planted early in the spring so that there is enough time for seedlings to develop before the summer brings hot, dry weather. They should also be planted early enough in the fall to be strong enough to survive frost and winter stresses. In planting warm-season species, avoid planting seeds in soil too moist and temperatures too low where seeds may rot before germination. There are also factors that determine the amount of seed to be planted. This seeding rate is often a very controversial topic. A wide variance appears in seeding rate information, charts, and guides. This is because every location has different environmental factors and forages are grown over a vast variety of locations. Seeding rates also differ between forage and seed crops. Become familiar with the range in seeding rates in your area. Remember that seeds have a high mortality rate. Some predict that only about one/third of the seed sown will reproduce seedlings and only half of those survive the first year. 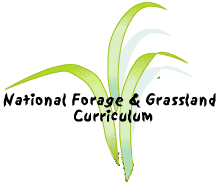 The main objective is to seed enough for good forage production. Seed is a minor expense, and high seeding rates may prove to reduce the weeds. There are many methods for putting seed into the ground. Some require specific requirements to be successful. Others are reliable in a wide range of conditions. Many seeding methods rely on removal of existing plant growth, done be tilling (plowing) or by applying herbicides. Tillage also turns under many of the weed seeds near the surface and brings up other materials that are desirable such as lime and minerals. Tillage will cause some soil moisture loss from evaporation and leave the soil less anchored, which may lead to erosion. Allowing some top refuse like clippings, twigs, and mulch has been found to be beneficial for emerging seedlings. Tillage will also bring new weed seeds to the surface, and that should be expected in the overall plan. Since tillage has some drawbacks and requires machinery, time, and expense, some forage producers use no-till establishment. Existing plants are killed with herbicides and seeding can still be done in a variety of ways. Young plants sown with no-till practices may require more care in terms of fertility, pH, and water. The general goal is to put the seed in uniformly at a shallow depth (1/4 " to 3/8"), place fertilizer near the seed and firm the soil around the seed. Most machinery will place the seed and roll the soil, but in broadcast seeding the seed is distributed and rolling must be an additional step. Rolling can be done by machine, or by dragging something heavy (board, light chain, or brush) over the seeded area, or allowing livestock to trample the seed into the ground.